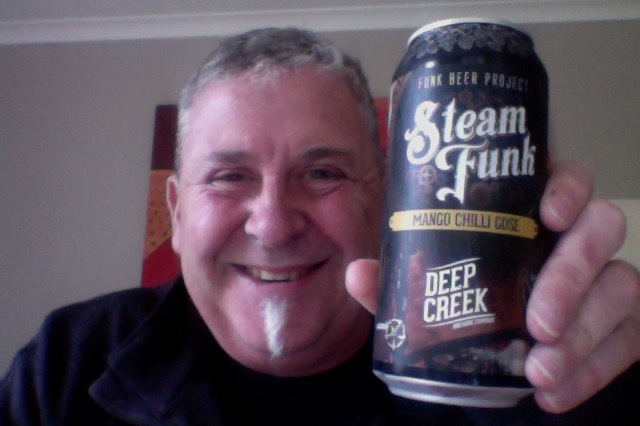 Deep Creek – Steam Funk – Mango Chilli Gose. I know I said I don’t like the sours, but they keep popping up, some of them more compelling than others, and I’m compelled to try them. This one the Beer Jerk Beer of the week, and I know, being a day late, that it’s quite polarising. I’m expecting cloudy and aromatic in some way and chilli heat. I can’t wait and started early on Friday afternoon because I’m a day late, for reasons you might discover in a later, rare, non beer post. This is 5% ABV beer in a 440ml can, making it about 151 calories a serve size and 1.7 standard drinks in NZ. Brewed by Deep Creek Brewing Co This is in the style that is a Grodziskie/Gose/Lichtenhainer and they did that in Silverdale, just North of Auckland, New Zealand, but they also brew at the pub in Browns Bay. The Gose lime juice flavours and velvety sweetness of mango come together perfectly, with a gentle chilli warmth on the finish, like the sunset at the end of a long, beautiful summer’s day. Brewer Johan Lagercrantz figured that mango and chilli makes for a delicious combination in cuisine so decided to create a beer with those ingredients. Goses are a historic style that have been brewed for over a thousand years in northern Germany with the slightly salty waters of the Goslar River. This beer also includes a whopping 10% mango which makes for a pretty sweet and juicy foil to the delicate flavours from the chilli, salt and pink peppercorns. On opening this is much like other sour beers, a light tangy aroma, this one though with a strangeness to it, almost fishy! or fish paste. Pour is a cloudy orange, which is as expected, and the light white head disappears quickly to a film film of memory. Goodness me !!! That’s peppery, and hints of chilli in a beer that is both sour and tart, which middles with a softer sweeter thing of presumably the Mango trying to escape. Finish and linger is pepper. Can’t help thinking the aroma is a little off, and like fish paste, don’t even know where to go with that. But this is nice drinking despite that, the chilli really lights this up and the pepper plays that high note, but the mango is what holds this together in a bit of a juice bomb. The pdubyah-o-meter rates this as 8 of its things from the thing. This is lovely as a beer, that twisty aroma aside, with lovely amounts of pepper and chilli to keep it dancing on that lovely mango sweet middle. A beer that’s easy to sup, and also to sip because it is very entertaining. Where did I get it? BeerJerk Beer Club . Would I have another? I know they have another variant on tap at the pub, I’ll try that. Would I share with a friend on a porch and set the world to rights? I think so, this has the right amount of pepper and chilli in it to make it different and unusual and the mango thing is lovely and soft. I liked it enough to share it. I love spicy food. The spicier the better. I love beer. I tried a chili beer once upon a time. What could go wrong? Well, no, that’s just not what beer is supposed to be. Then they went and combined it with a gose?!?!?! Can’t even begin to imagine. I’ve had beer that just had chilli oil in them, and that was supposed to be cutting edge, when it was rather disgusting. A Salty based beer with chilli and pepper though, that was ok, the aroma was unsettling, and that seems a common comment, it may have been the mango though, of all the chilli beers I’ve had, which are not a lot, this was was one of the better ones. This entry was posted on June 16, 2017 by Philip Walter in Beer, Beer of New Zealand, Beer Review, Brewed By, Craft Beer, Critic, Deep Creek, Grodziskie/Gose/Lichtenhainer and tagged Beer Jerk NZ, Canned Craft Beer, Deep Creek - Steam Funk - Mango Chilli Gose, Deep Creek Brewing, Deep Creek Gone, Deep Creek Mango Chilli Gose.